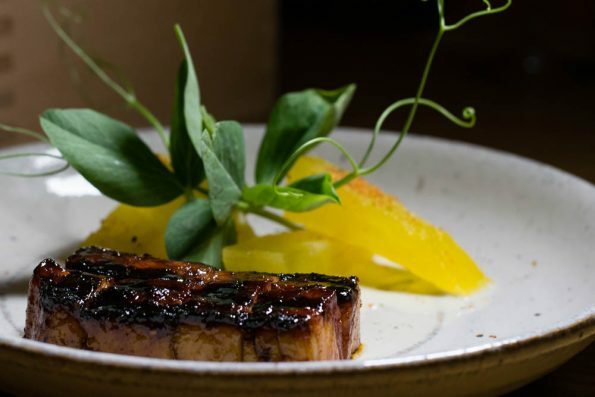 If you don’t believe food is an art form then you have never dined at Roka Akor. Not only are diners treated to a phenomenal tasting meal but a stunningly beautiful one as well. 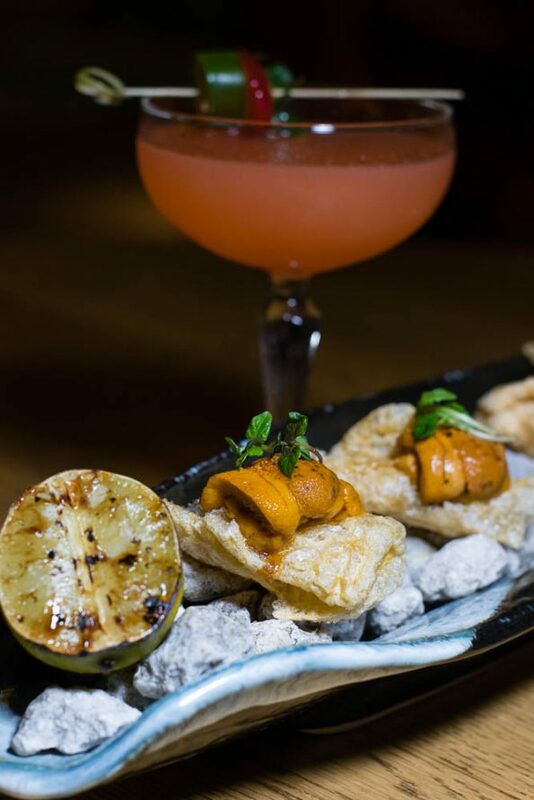 We recently visited Roka Akor in Scottsdale for their Tequila Dinner. We were treated to a five-course menu prepared by Executive Chef Jason Alford, paired with premium tequila cocktails created by Chris Gorogias. Our thoughts: The chilled soup was an excellent start to the meal. The mint pesto was not overpowering yet brought fantastic flavor to the soup. The mezcal cocktail was well balanced, neither the mezcal or Lillet stole the show. Our thoughts: The uni course was extremely interesting. Typically very briny with an iodine flavor, the uni was balanced by the charred lime juice. The ceviche was some of the best we’ve ever had and was full of flavor. Both courses featured brilliant use of texture with a softer protein paired with a crunchy element. The spiciness of the jalapeno in the anejo cocktail added a second level of flavor to the course and paired excellently. Our thoughts: The third course was by far our favorite (though the others were all also truly stellar). The braised pork belly melted in your mouth and was excellently partnered with the watermelon (think salty and sweet perfection). It was the best pork belly we’ve had in a long time! The king crab with watermelon radish was as much a treat for the eyes as the mouth. Not only was the food absolutely divine (watermelon radish butter sounds weird but is delicious) but the cocktail was out of this world as well. Beautifully simple yet well executed, we liked this cocktail so much we hopped over to the bar afterwards for another! 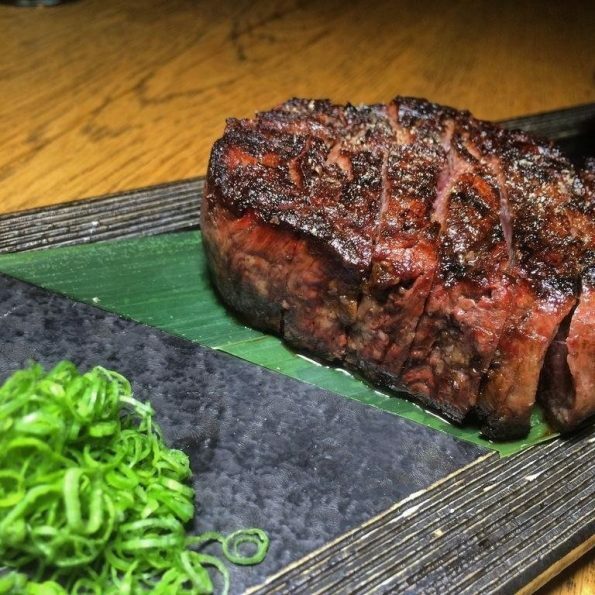 Our thoughts: So we all know Wagyu is always going to be an amazing beef. We could also mention how wonderfully prepared it was and it was cooked to a perfect medium rare. However, the best part of this course was the education. We learned that Kozatsu Wagyu is actually a half breed cow of sorts, 1/2 Wagyu and 1/2 Holstein. This gives the meat the features of Wagyu with the beefiness most people love from a steak. The cocktail served with this course was perhaps the most surprising of the evening. Think Old Fashioned meets tequila with the sweet vermouth in the cocktail smoothing out the edges of the anejo tequila. Our thoughts: There couldn’t have been a better way to wrap up this meal than with this dessert. The flan was light and airy. While still sweet, the anise foam toned down the dessert’s sweet factor allowing for the sweeter cocktail pairing. We really enjoyed our meal at Roka Akor. The whole meal was so much more than just a meal. It really is an experience. The menu is innovative yet simple. Not simple as in bland or boring but rather it is uncomplicated yet not elementary either. We highly recommend checking them out! What restaurants have you been to that you feel are “an experience”? Leave your comments below or use the hash tag #GeekEats to share your favs! We can’t wait to hear all about them!